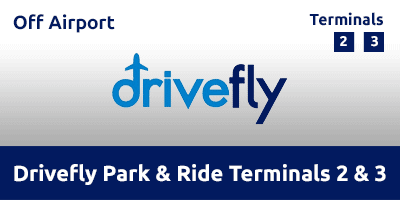 Located just 15-20 minutes from Heathrow Airport and a couple of miles off the M4, Drivefly Park & Ride offers cost-effective parking for those travelling from Terminal 2 and Terminal 3. Anyone flying from Terminal 4 can use this service by taking a transfer train from Terminal 3. Simply drive to the car park, unload your bags and jump on one of the regular minibus transfers to the nearby check-in desks while your car’s parked for you. Open from 4am to midnight, the car park is protected by 24-hour manned patrols, CCTV and security fencing. Enter your details now to get an instant quote for your travel dates. Transfers run every 15-20 minutes from 4am-midnight. While away, your vehicle will be looked after in a car park protected by CCTV, secure fencing and regular security patrols throughout the day. This service operates between 04:00 and midnight, 365 days a year. At the lights, continue straight on to Trout Road for 0.1 miles and Drivefly Park & Ride will be signposted on your left hand side. When you arrive at the car park, park your car in one of the designated drop off bays and unload your luggage. Drivefly will transfer you to your designated terminal. Buses run every 15-20 minutes from 4am to midnight. These will be given on arrival at the Car Park.